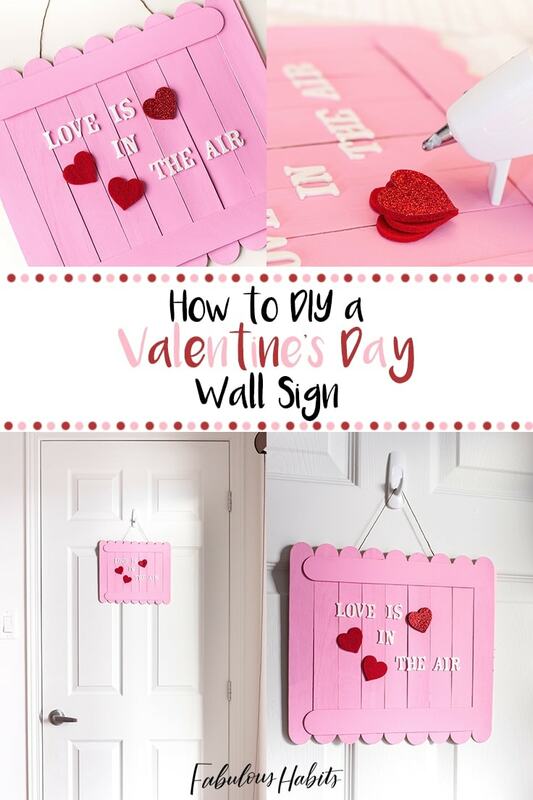 Show ’em that you care with this super easy DIY Valentine’s Day wall sign. C’mon! 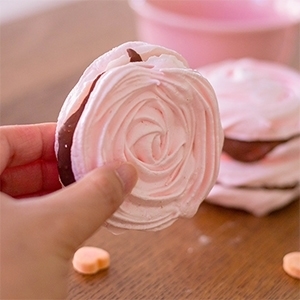 It’s time to spruce-up your home for the most romantic time of the year! Hello, hello! Lisa reporting for duty! 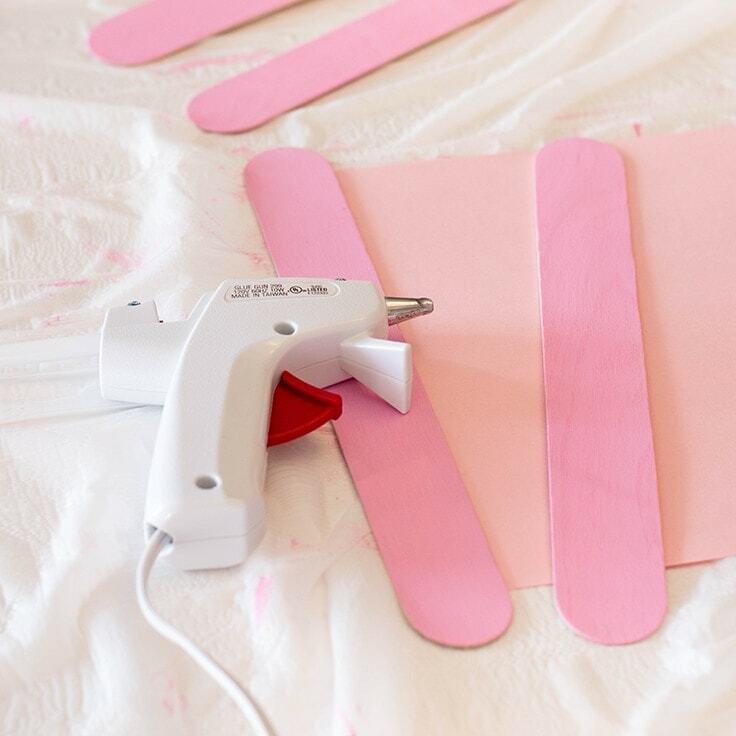 I am so excited to kick off my first Kenarry post of the year with this DIY Valentine’s Day wall sign. I am a huge fan of Valentine’s Day. 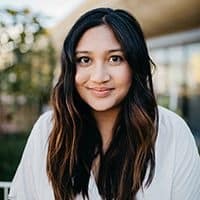 Heck, I was a fan of the holiday even before I met my husband. Over the years, I always tried to find a positive way to celebrate V-Day. When I was younger (and yup, very single), my best friend and I would go on “BFF Dates” and we would say ‘cheers’ to February 14th together! Now that I’m a mama, I am celebrating this special day with my little family. I don’t go too crazy on Valentine’s decorations, but I couldn’t help but make this little number. The best thing about this DIY is that it doesn’t take much time to complete. 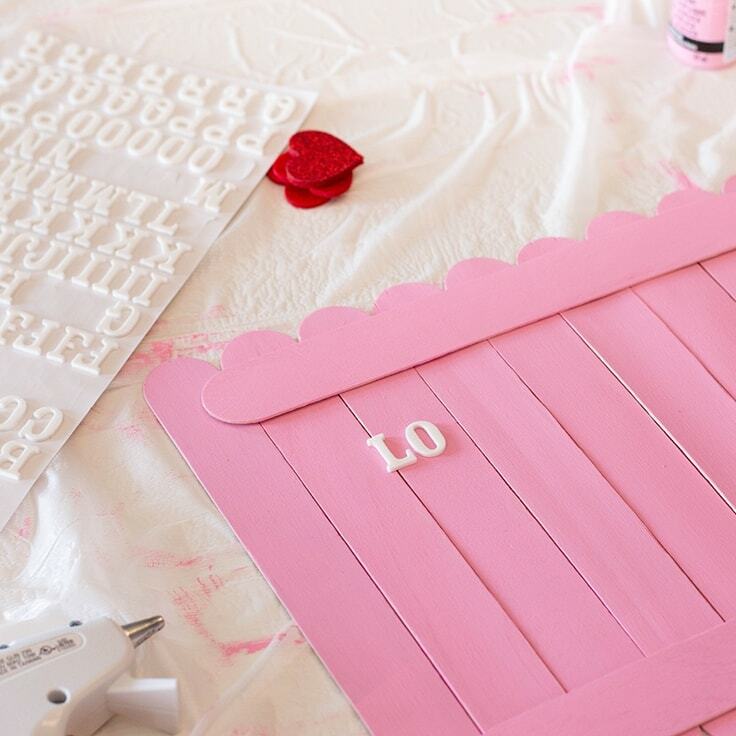 You’ll have a bright, romantic, and super cute sign up on your door in no time! 1 pink cardstock, 8.5 x 11 in. 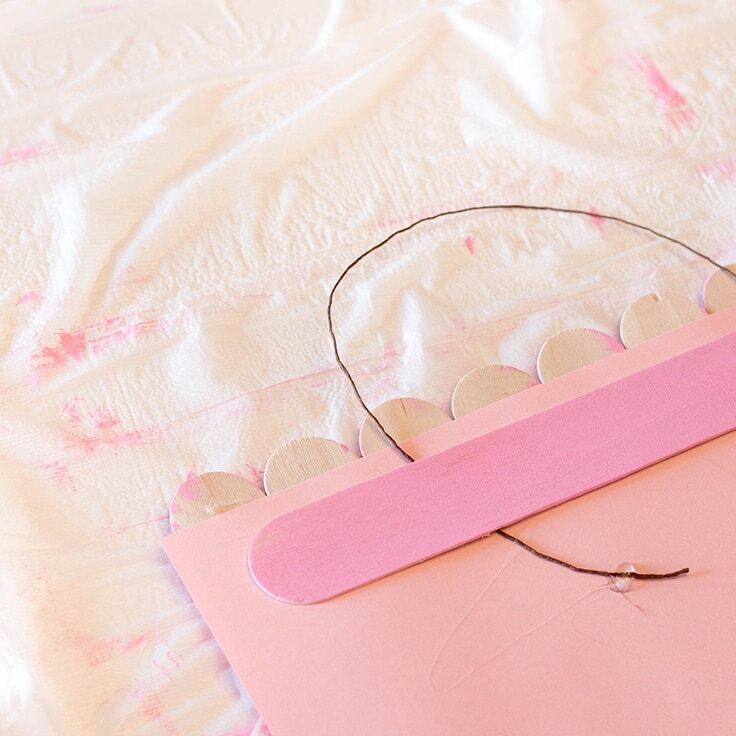 Place your cardstock horizontally on your working table. 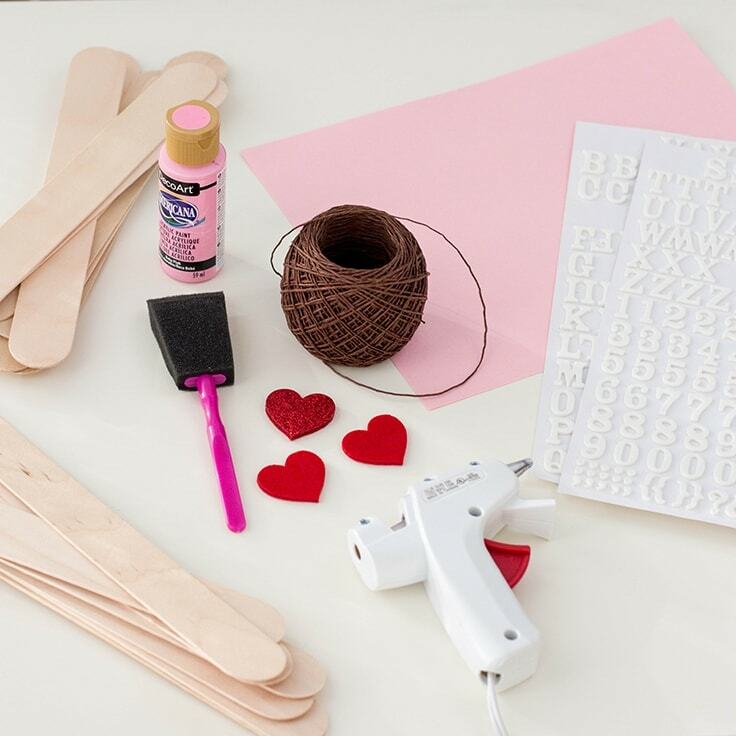 Lay out your wooden sticks side by side on the cardstock so you get an idea of how many you’ll need to cover it. I was able to fit 9 popsicle sticks across, and then I kept an extra 3: 2 to glue on the bottom and top of the sign (horizontally), and the third for the back, to secure the twine. 2. Roll up Your Sleeves and Start Painting! Line your working surface with a garbage bag or newspaper (you won’t want to make a mess!). 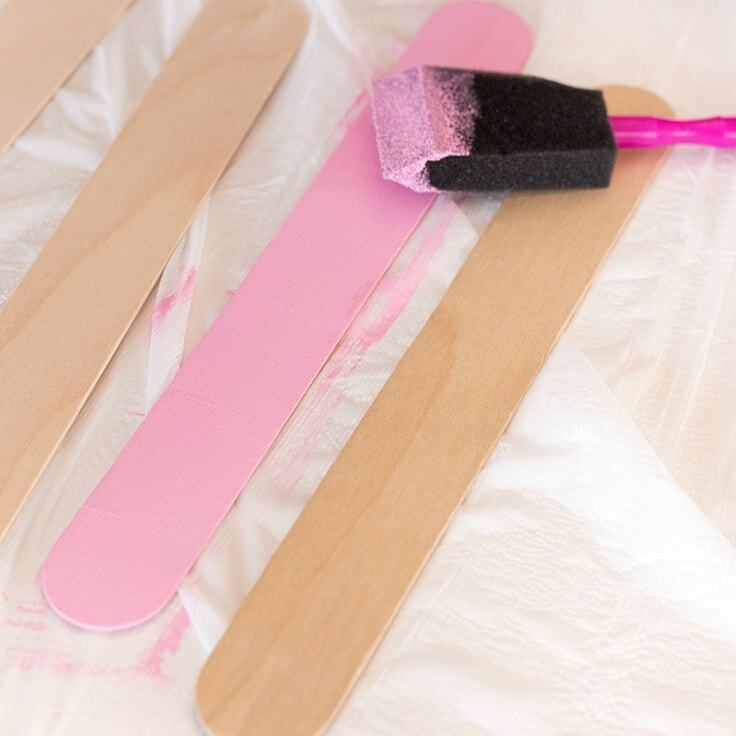 Paint one side of each wooden craft stick and allow to dry completely. 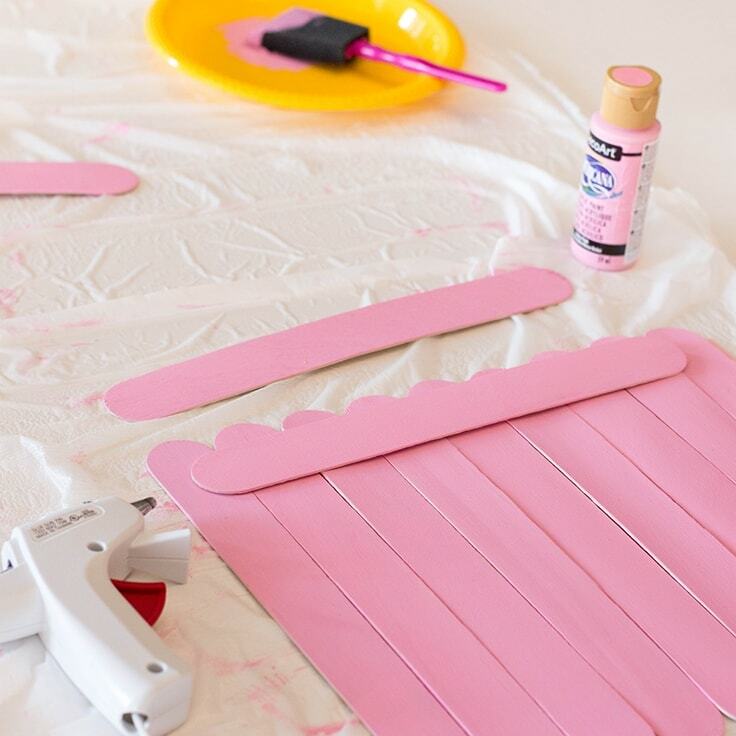 Glue each popsicle stick onto your cardstock. Remember, you’ll want to cover the entire cardstock and then add 1 to the top and bottom of the sign. Allow to dry. 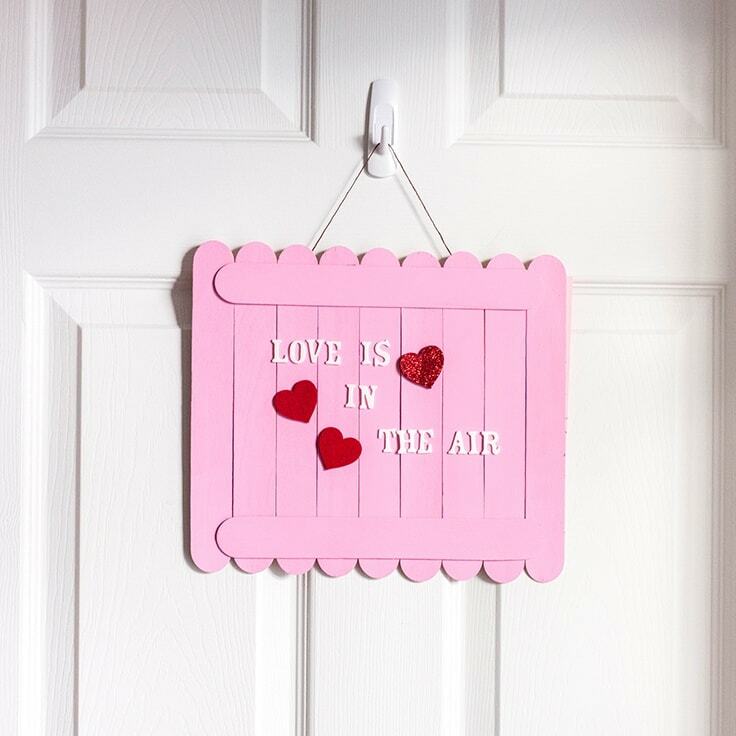 Once everything is nice and dry, place your sticker letters on the sign to say “Love is in the Air” (or, any romantic phrase of your choice!). 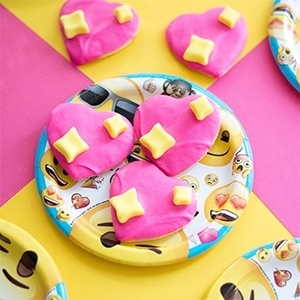 Glue your hearts (wherever you please!) onto your sign. 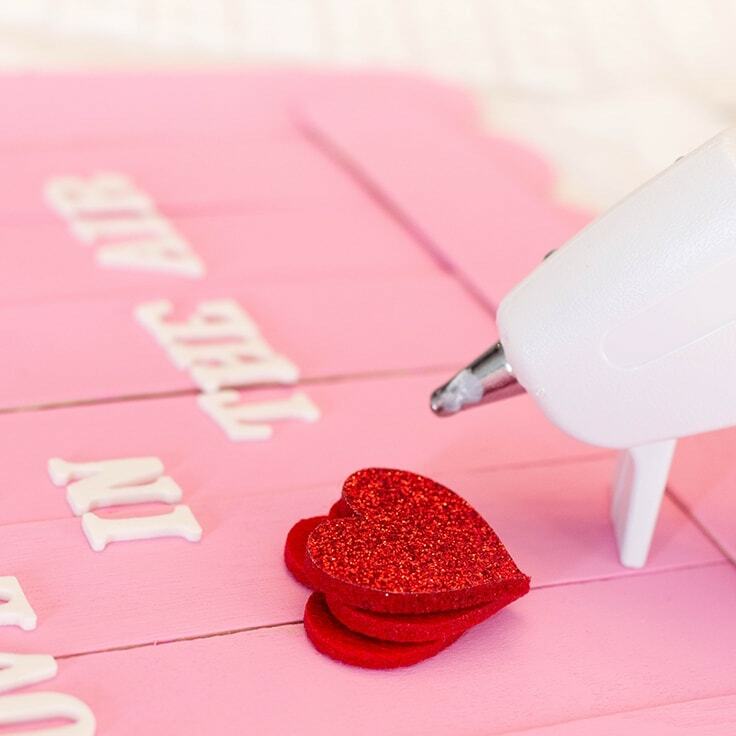 Some foam hearts have an adhesive backing, so gluing won’t even be necessary. 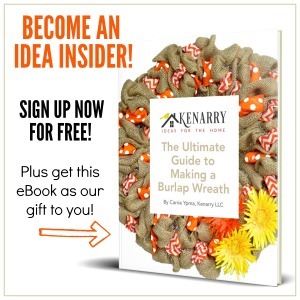 Cut about 4 inches of your waxed twine and glue it onto the center back of your sign. I used a popsicle stick and glued it on top of the glued portion of the twine just to secure it even more. 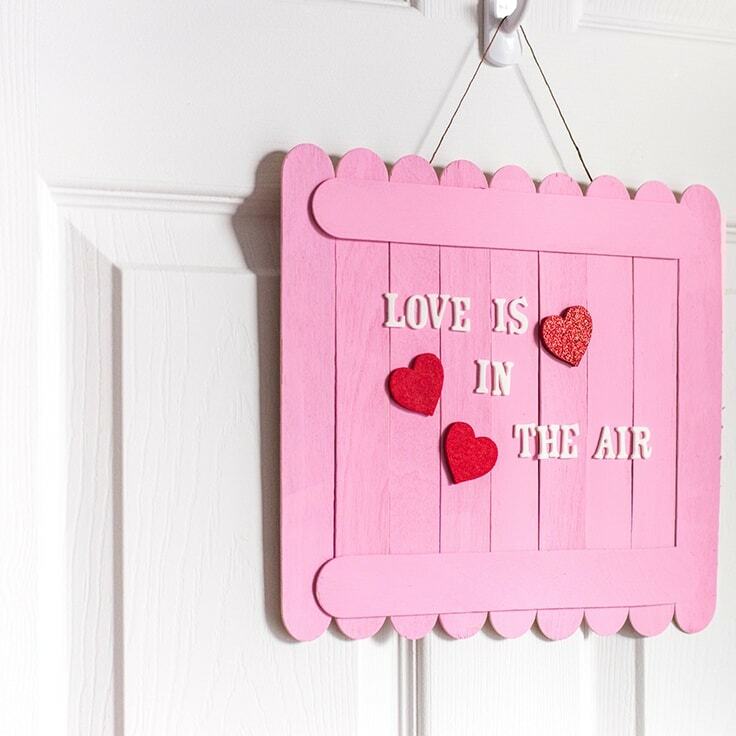 Hang it up on your door (with the help of a sticky hook) and feel the love!